The site of Nos. 22, 23 and 24 in North Street is now under the multi-storey Mary Arches Street car park. 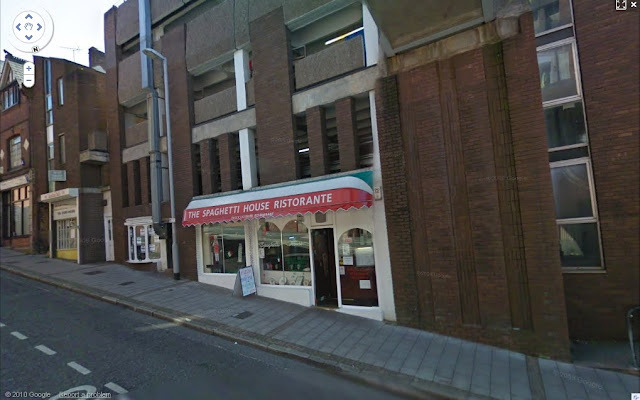 Built in the 1970s, the construction of the car park, planned in the 1960s, resulted in the complete demolition of all of the buildings on the corner of North Street and Bartholomew Street East. Most of the buildings that were destroyed only dated to the late 1800s, when much of the west side of North Street was demolished in order to widen the road, although Nos. 22, 23 and 24 had a slightly different fate, even if the end result was the same. On 02 July 1862 a report appeared in Trewman's 'Exeter Flying Post' under the title "Fall of a House in North Street". "Local archaeologists", the article beings, "will learn with regret that one of the oldest houses in North Street, the once, no doubt, splendid residence of some of the wealthiest of those old citizens, whose portraits now adorn the walls of Exeter Guildhall, has just fallen down before, what they will perhaps consider, the sacrilegious hand of modern improvement." What makes the demolition of this ancient building of particular interest is that its destruction was the result of accident rather than design. According to the report, Nos. 22, 23 and 24 once fomed a "handsome structure" that dated back to the 1560s having had "400 years [of] uninterrupted existence." The report contains a brief description of the building: "It is built in the light airy style of the day with bow windows, ornamented with scroll work, apparently carved in oak", and then goes on to describe the process by which it had been converted into tenements: "In the course of its 400 years, however, this once almost palatial edifice has passed through the vicissitudes of seedy splendour. Courts, crowded with industrious aritizans and their families, have grown up around it on all sides, occupied its gardens, and hemmed it in reducing its goodly proportions to such an extent that what was once the cynosure of all eyes has long since been scarcely noticed, except by those who looked at its upper stories, towering above the buildings by its sides. Its drawing rooms have been turned into bed chambers, its entrance hall partitioned off into shops". As far as I know the only image of the house prior to 1862 appears in a drawing of North Street by the Exeter artist John Gendall, shown at the top of this post © Devon County Council. It dates to c1840 and depicts the view down North Street towards the Iron Bridge (visible stretching away towards St David's in the distance). The magnificent twin-gabled facade of Nos. 19 and 20 appears on the left. No. 18, with its pedimented oriel windows, is just visible to the far left. Next to Nos. 19 and 20 is a brick-built facade, probably from the late 18th century. This was No. 21 North Street. 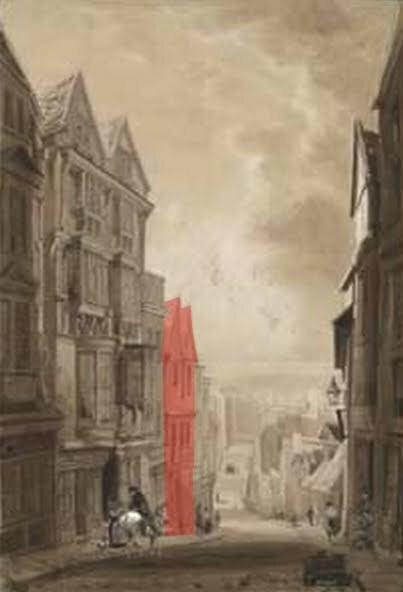 The twin-gabled house, highlighted in red, must be the late-Elizabethan townhouse that was Nos. 22, 23 and 24. Unfortunately the drawing fails to show the house in any sort of detail. In the summer of 1862 No. 22 North Street, one of the three tenements carved out of the Tudor house, was purchased by a builder from Magdalen Street called Mr Knowling. Apparently Knowling bought the property for his son to use as a grocer's shop and quickly began to effect "some alterations, with the view of enlarging the underground cellars", work which necessitated the removal of a "quantity of the foundations". Work progressed with Knowling adding props underneath the building to secure it until the improvements had been completed. But the old house was having none of it. What the newspaper report refers to as "several slips...in the structure" should've indicated to the builder that he was fatally undermining his newly-acquired house. The report ruefully adds that "Mr Knowling...seems to have trusted a little too much to the stability of the house" and carried on the work "beyond what might be considered either prudent or safe". In the early hours of Monday 30 June 1862 an old woman and her daughter, who were living on the upper floors of No. 22, noticed something was drastically wrong as the 400-year-old timber framework started to give way above its damaged foundations. They fled the building and within minutes one entire wing of the property "came down with a crash, to the great dismay of the denizens of the neighbourhood." Neighbouring properties were evacuated, as was the still standing portion of the 16th century townhouse. No-one was injured, but in the aftermath of the collapse the rest of the building i.e. Nos. 23 and 24 was demolished.